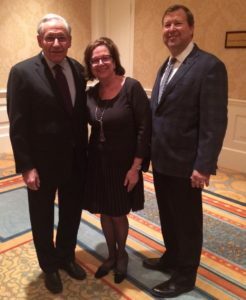 On November 15, 2016, exactly one week after the tumultuous US presidential election, iconic investigative journalist Bob Woodward enthralled members of the Dallas Bar, judges and community leaders with his memories of historic moments in American presidential history from Nixonian times to the present. 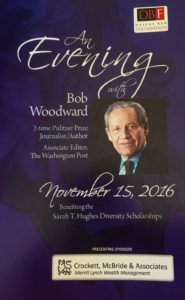 A double Pulitzer Prize honoree still writing for The Washington Post, Mr. Woodward spoke with integrity, insight and good humor of his encounters with corruption, intrigue and courage over the course of his long and storied career. He wisely counseled future generations to be quick to report, but slow to judge the events unfolding in our ever-shrinking news cycle. 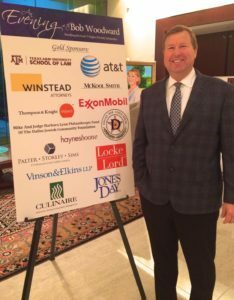 Palter Stokley Sims PLLC was a Gold Sponsor of this event, held at the historic Belo Mansion, home of the Dallas Bar Association. The annual event raises funds for Sarah T. Hughes Diversity Law School Scholarships, granted to deserving young people who intend to practice law in and serve the Dallas community. John and Kathy Palter and Nathanial and Jeanette Martinez attended for the firm, accompanied by distinguished clients and friends. Sarah Tilgham Hughes (1896-1985) was the United States District Court judge who administered the presidential oath of office to Lyndon B. Johnson on Air Force One, becoming the first–and to date, the only–woman in US history to swear in a US president. One of the Dallas Bar Association’s most distinguished members, Judge Hughes has been described as a “giant in law, rights of women and minorities” (Louise Raggio) and as a “life-long fighter for equal rights for women, and early advocate of civil rights for minorities” (Judge Barefoot Sanders).